This is a continuation of the last post where we began sharing common mistakes family historians make getting started and throughout researching their family history. Advice not to rely on one source type will help you discover more about your ancestor and extended family. You can usually find more than one type of documentation to identify an ancestor. Relying on only one source might limit the amount of information you discover and the accuracy of that information. For example, Find A Grave has become a very common resource for locating the date of death and place of burial of an ancestor especially if the person died after 1961. Death certificates are not yet accessible online after 1961 in South Carolina. Ancestry.com. 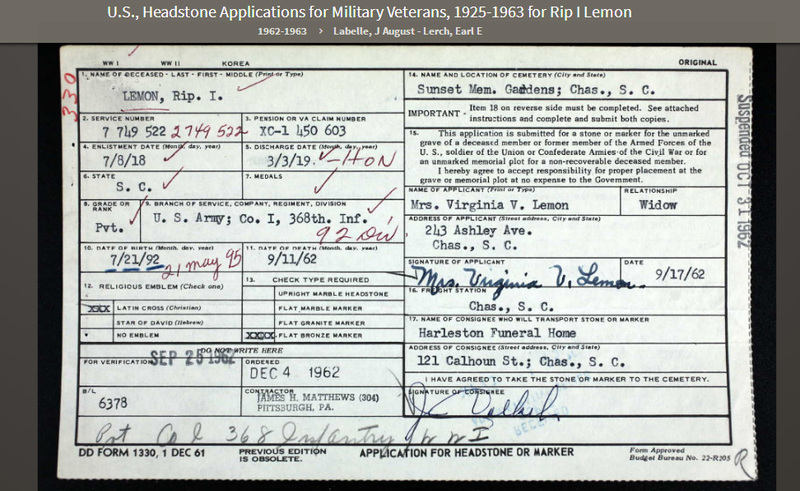 U.S., Headstone Applications for Military Veterans, 1925-1963 [database on-line]. Provo, UT, USA: Ancestry.com Operations, Inc., 2012. Original data: Applications for Headstones for U.S. Military Veterans, 1925-1941. Microfilm publication M1916, 134 rolls. ARC ID: 596118. Records of the Office of the Quartermaster General, Record Group 92. National Archives at Washington, D.C.Applications for Headstones, compiled 01/01/1925 – 06/30/1970, documenting the period ca. 1776 – 1970 ARC: 596118. Records of the Office of the Quartermaster General, 1774–1985, Record Group 92. National Archives and Records Administration, Washington, D.C.
His wife, Virginia Vance Lemon was still living at the time of his death because she is the person who applied for his headstone. Harleston Funeral Home in Charleston handled his arrangements. He received an honorable discharge on March 3, 1919. Another source that may reveal more about Rev. Lemon would be his US Social security Application. He does appear in the US, Social Security Applications and Claims Index, 1936-2007 on Ancestry.com. A copy of the original application (SS-5) can be requested where potentially his parent’s names and birth place could be listed. One thing is for certain, the index to this database mentions Rev. Lemon in three other instances on records of his children. The beauty of this resource is that you can possibly locate ancestors in the index who were born prior to 1900. It is also possible for you to discover their children’s names even if you search for the father only. Look for ways to identify an ancestor whose death record is not available online. Let us know what resources you used and what you learned on the Facebook post (link FB post) for this article.